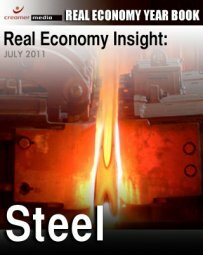 Creamer Media’s Real Economy Insight brief on steel offers insight into the global and South African steel markets and examines issues, such as pricing, employment and the stainless steel market, besides others. A full summary of Creamer Media's Real Economy Yearbook – covering the Automotive, Construction, Electricity, Liquid Fuels, Steel, Water, Coal, Gold, and Platinum sectors – is also available from Creamer Media. To purchase a PDF copy of the full contents of the Real Economy Year Book click here. Published on: 06 July 2011.